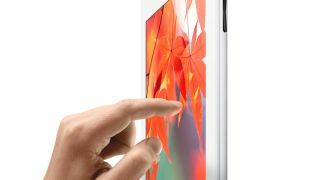 The 'iPad isn't for content creation' card has started rearing its ugly head again, this time prompted in part by the appearance of more Google Android tablets like the more Google Android tablets. The Nexus 7 (I've got one so you don't have to) is very much not a content creation device: Google's announcement focused on how it integrated with its Play store for content like books, games, films and TV shows, with ne'er a mention of actually doing anything creative. The iPad, on the other hand, is much more capable of creativity than the Nexus 7, largely because of its big screen. This isn't simply about the size of the keyboard - focusing on the keyboard as the only route to creativity is as silly as insisting you can't paint with your fingers. Instead, the larger screen (yes, aside from the iPad mini) enables developers to create richer apps that give you more creative options available at any one time. It's all about what the large screen opens up to developers, not just users. I don't think there's anything wrong with devices that focus on content consumption, though. If you take a look at what you do with desktop computers most of the time, it's more consumption than creation. Sure, you might write a little, do a bit of photo-editing. But I spend most of my time on my Mac listening to music (consumption), using social media (mostly consumption) and pootling around on the internet. Being what is politely termed a 'veteran' computer user (and impolitely termed 'an old git with ever-more grey hair') something has been nagging at the back of my head about all this debate. It seemed so familiar, somehow. And then it hit me: it's basically the same arguments that were made when the first Mac was launched. I remember being told how the Mac was 'great for graphics, but you can't do proper computing with it' by wispily bearded computer science undergrads who viewed anything that didn't involve baroque keyboard shortcuts as trivial. Unix windowing systems were all right, because they let you run more terminals at the same time - but no way could you do real, productive work with a graphical user interface. You just didn't get 'close enough to the code'. Can you get more done with a mouse? This kind of thing happens every time the paradigm of computing shifts. The old guard, reared on 'how we do things', simply can't stop trying to impose the way they work on to the devices that meet the needs of other people. The Mac was useless because the mouse 'got in the way' of doing 'proper' computer stuff on a command line. When these kinds of tech people talk about 'creation', what they mean is programming, because that's the only kind of creation that really counts for them, and they're not able to conceive of the new ways that new interfaces let you create things. All the other hundreds of kinds of creativity, from playing around with photos, writing words, to manipulating data with your fingertips - all these kinds of creativity don't really count, because they're not complex commands. With the iPad you get to create with the most intimate and effective tools you have, honed by millions of years of evolution: your fingertips.